Rotary Club of Erith - welcome! Please scroll/swipe down through this page to find out more about us, in addition to the pages linked in the menu, top-left. 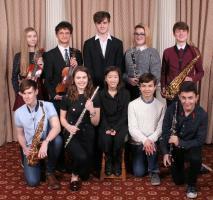 The Rotary Clubs of Bexley came together to support one of our favourite nights of the year, as we celebrated the musical talents of young people across the Borough. 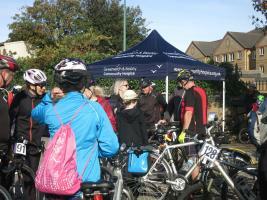 Supporting Greenwich & Bexley Community Hospice. Fun in the sun and England won! Walking for 'The Upbeats' - 2019.
it's a privilege to support such a wonderful cause! 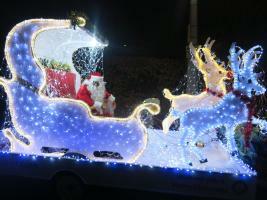 Goodwill Week may be over for another year but it won't be long before Santa is back on our streets again. This was our chance to support our fellow Rotarians at North Downs, in their efforts to raise funds for 'High Hopes For Children'. 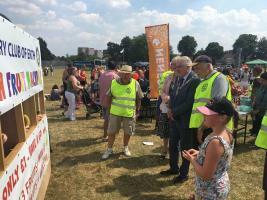 Erith Rotary is one of 34,000 Clubs Worldwide, where members give their time to support their local community and International projects. Our Club has proudly served the people of Erith since it was founded in 1929. Over that time, membership has flourished as has the contribution that we have been able to make to projects both large and small. Whether it be helping at a local fete or organising a grand event to support people less fortunate than ourselves, we like to get involved at all levels and what's more, have fun doing it! Perhaps the one event that most people associate with us, is our Goodwill Week, when we join up with Father Christmas to tour the local streets spreading happiness along the way. So many people talk about how they remember seeing Father Christmas come around when they were young and now they get the chance to share it with their own grandchildren. The look on people's faces is thanks enough for anyone! Another major event in our year, is the Erith Fun Day. Here we turn our attention from 'fund to fun raising' as we join together with members of the local community to create a day that offers a whole range of activities for both young and old to enjoy. This is a day out where families really can come together and just have fun. However, it would be wrong to suggest that this is all that we do. We also take every opportunity to enjoy each other's company, whether that be through our weekly meetings or the social side of our club! Friendship is a key element in our Club and we pride ourselves on our ability to make visitors and new members, most welcome. If this sounds like something that you would enjoy, why not come not along and check us out! We meet almost every Wednesday lunchtime throughout the year at The Europa Centre, Maiden Lane, Crayford 1 p.m. - 2.15 p.m.
Our first meeting of the month is now in the evening with a 7:30pm start. If this is more convenient for you and you would be interested in joining us, please do get in touch, we really would love to see you. Club Meeting with lunch at The Europa Gym. - Steward - Ian Starkey. - Steward - Alex Newson. - Steward - Ron Bowater. - Council Meeting to follow. - Steward - Alan Richards. 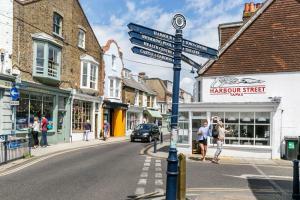 Join us for a 'Treasure Hunt' around Whitstable, followed by lunch at The Marine Hotel. 'A fun day out for all the family'.